Good friends, good conversation and good weather all combine for the perfect visit. 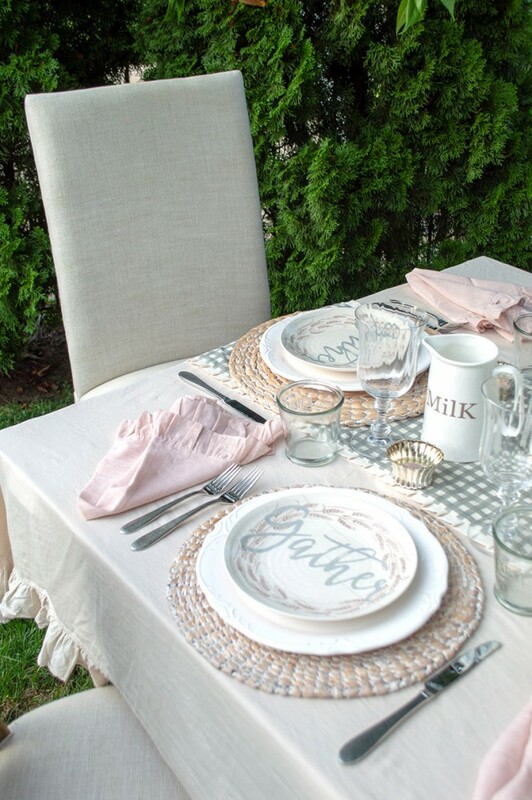 A bistro table is perfect for an intimate get-together where conversation is the order of the day. Enjoying the outdoors is one of the highlights of the warmer months. 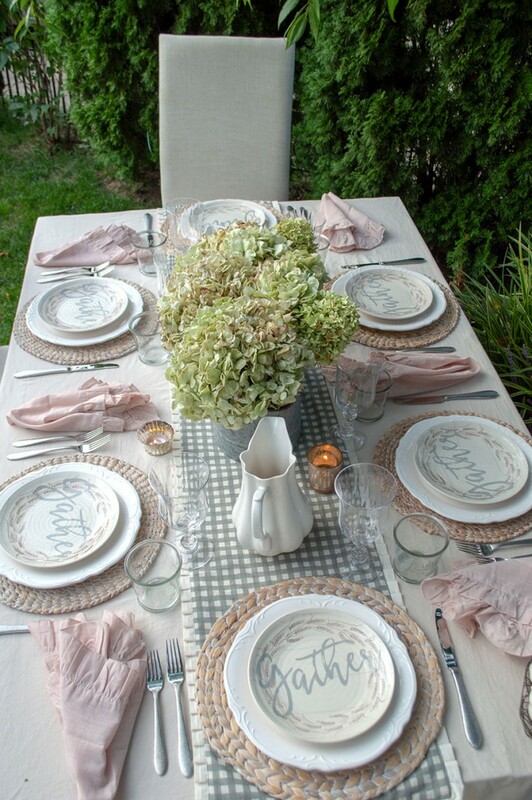 It is the perfect time to catch up with family and friends with an intimate and memorable setting. 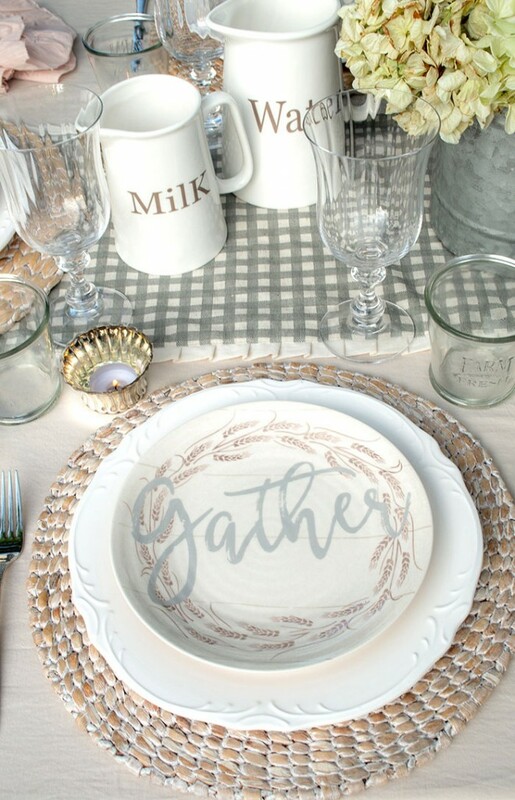 Dream up beautiful decor and an easy menu to keep things casual and stress-free. 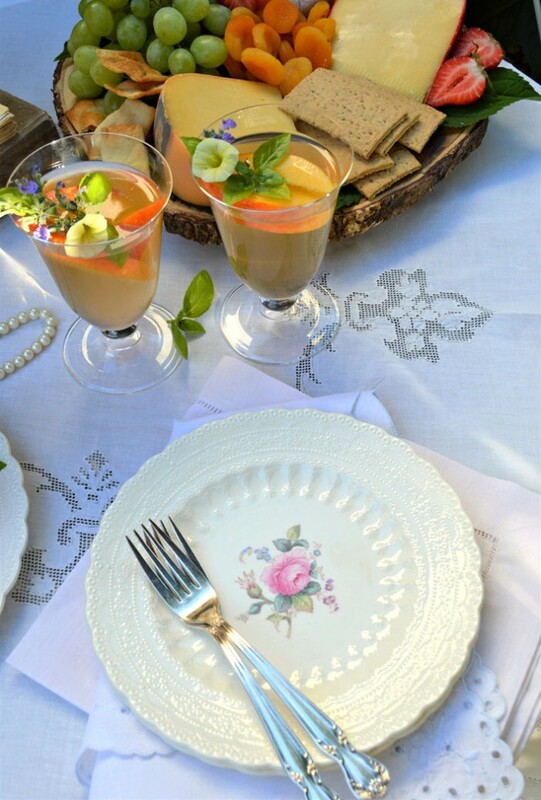 And if you already have a garden, terrace or patio, then these five tips will help with your own intimate and effortless garden entertaining. 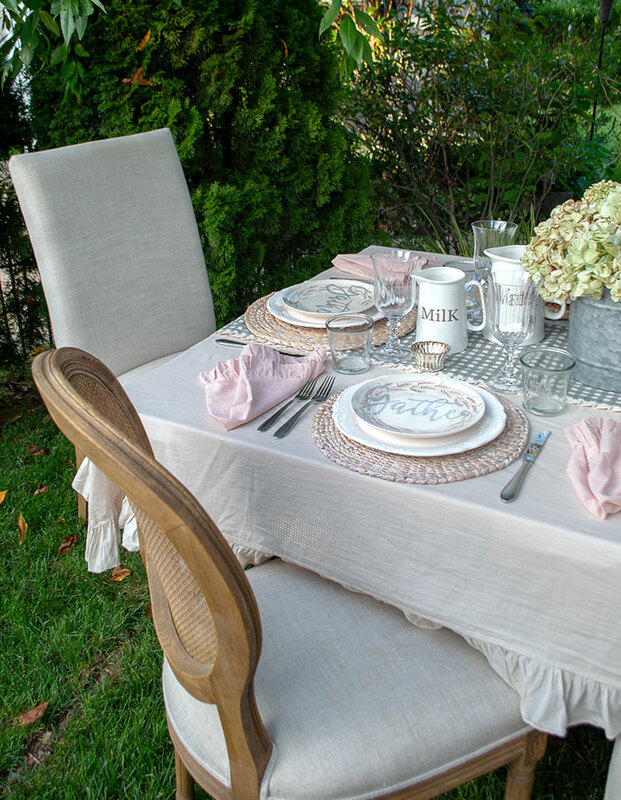 Looks for lacy details in vintage linens and floral motifs in antique china to recreate the look of old wold elegance. 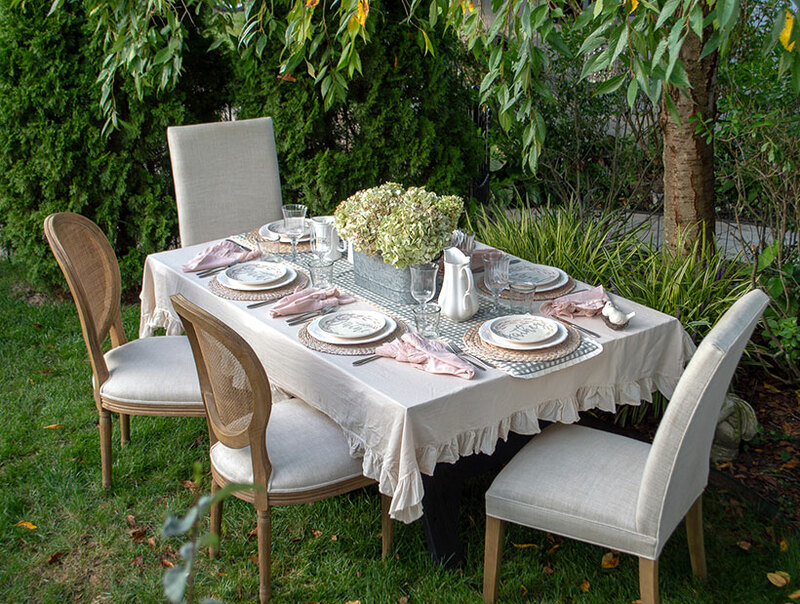 Two’s company and three might just be a crowd when entertaining at a bistro table. 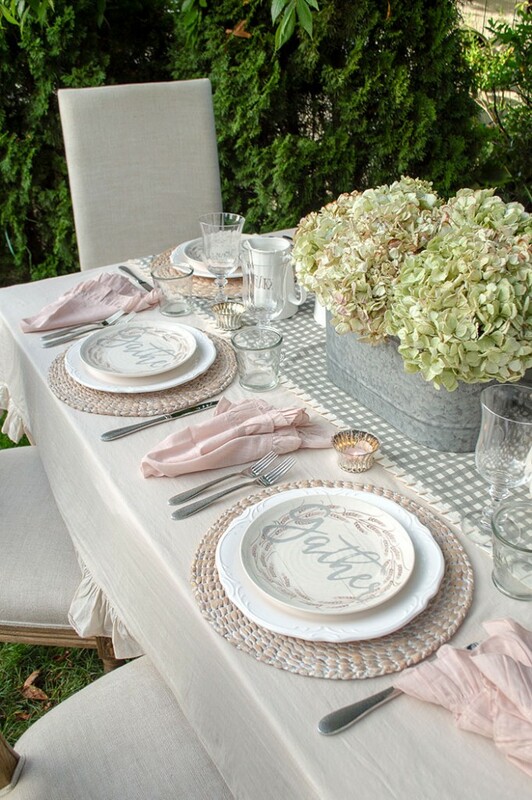 For this intimate garden-inspired setting, it provides just enough space for food and drinks. For personal comfort and to ensure the freshest flavor of your food, choose a shaded spot before you set up. 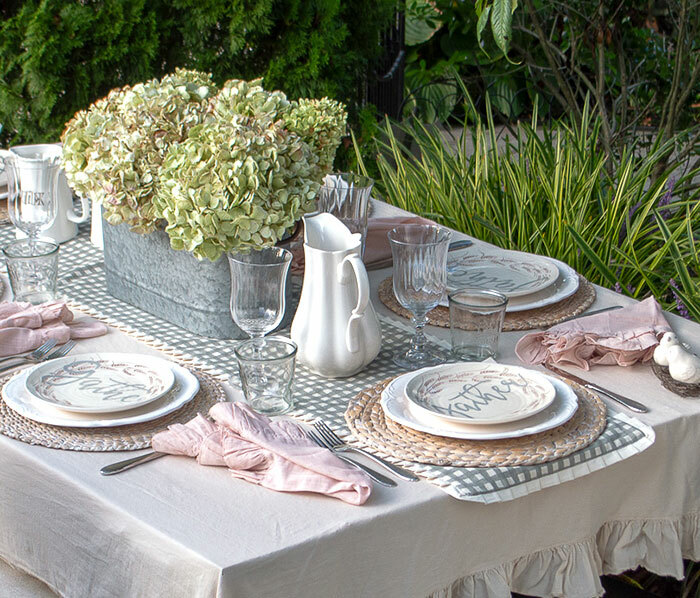 Choosing the perfect spot in your garden is the first step in planning your get-together. 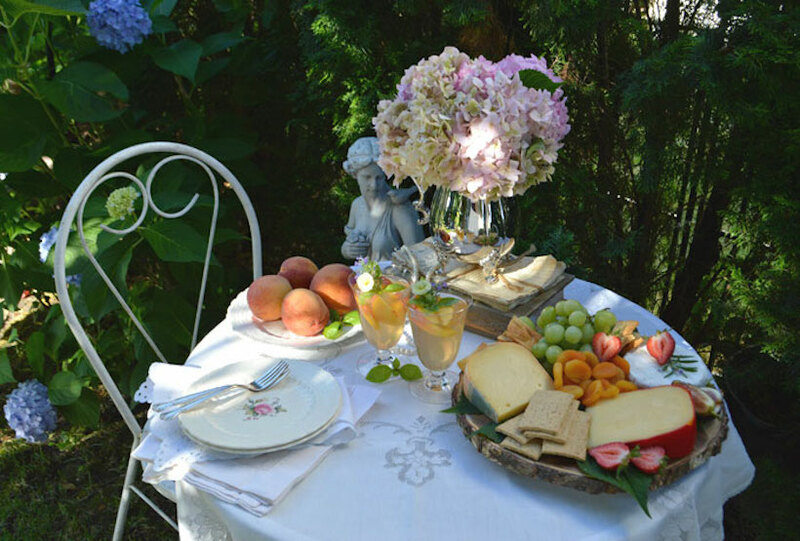 Find an area in your garden that looks inviting, pleasing, and that keeps your guests away from direct sunlight. I have a favorite area in our garden that is flanked by trees, hydrangeas and offers the perfect open air backdrop that invites one to relax and take in nature. It is enchanting this time of the year and provides plenty of shade. For a casual afternoon visit, there’s no need to spread a full meal. 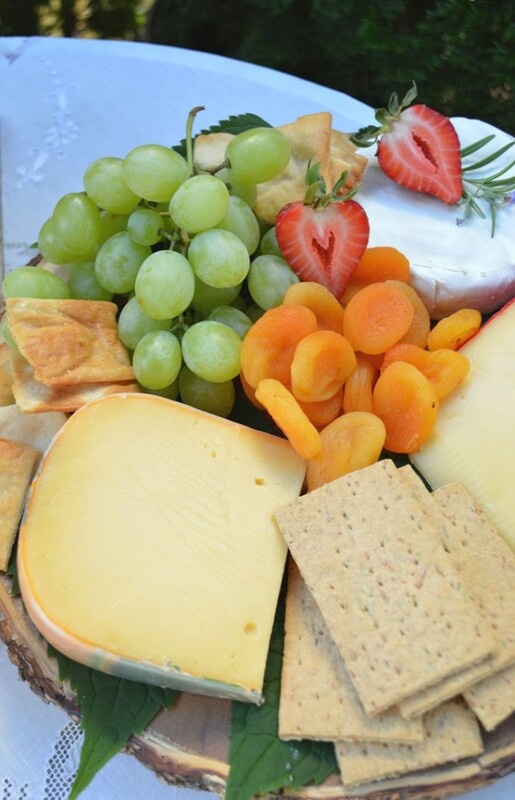 A fruit and cheese plate with a variety of options is perfect for snacking. 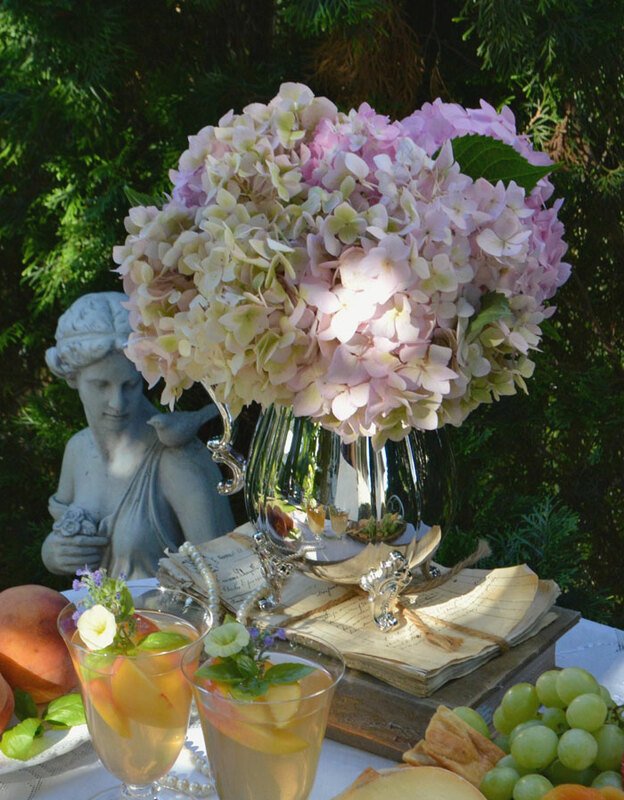 Stacked on an antique book and a bundle of hand-written letters for added height, this arrangement of fresh hydrangeas is perfectly suited for a simple and elegant event. 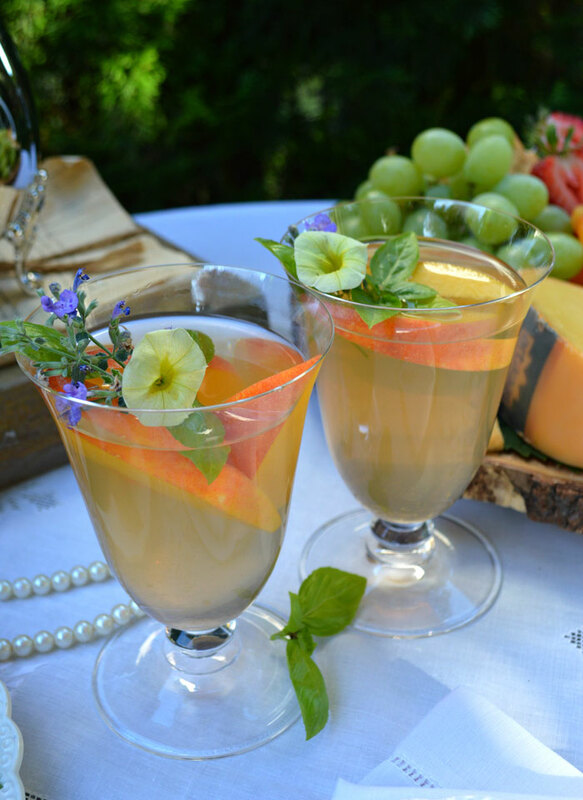 Janet Collazo shares tips for entertaining, home styling and cooking at her blog, Rosemary & Thyme. 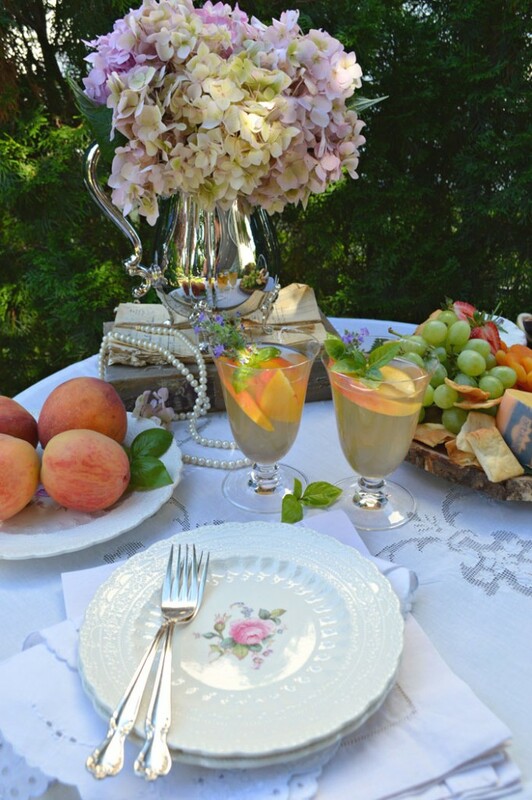 Stop by for more inspiration with a floral, vintage twist!